Stylish, Retro Lighting Still Made Here in America! Ion Lamp from School House Electric & Supply Co.
School House Electric, known for iconic American-made period lighting, earns kudos from Greenspiration Home for its unique retro lighting that captures the style of the turn of the century to the late 1940s. (3BL Media / theCSRfeed) February 8, 2012 -- At School House Electric, the goal is to match or exceed the quality of the antiques that inspire the company's lighting designs. Well, their lighting inspired us, especially this nifty Ion lamp, a perfect blend of industrial styling and simple elegance. 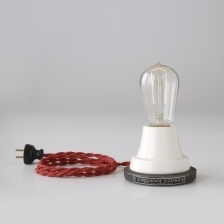 Best of all, the bulb, porcelain socket and fabric cord are all produced in Portland, Oregon. So you can get that cool, pre-World War II style without worrying about antique wires catching your house of fire. It's all new and it's made in the USA -- just the way we like it. School House Electric founder, Brian Faherty, recognized a need for period lighting while working as a real estate broker specializing in the sales of historic properties. He noticed that the lighting in most of these restored properties was lacking in historic integrity. He wondered what happened to the turn-of-the-century and mid-century lighting producers and began to investigate. His search led him to a company in upstate New York where he found a collection of original cast iron molds for lamps made around the time of the Great Depression. He decided to restore the molds and put them back into service. Hence, School House Electric was born. In its sustainable approach to business, School House Electric has also restored some of the Depression Era’s “waste not, want not” attitude. "Sustainability starts with moving away from disposable, poorly made, unfixable products that quickly end up in the landfill," said Michelle Steinback, EVP of Marketing & Communication and Design Director at the company. "We run a green factory where there is zero industrial discharge into the sewer system. We use domestic raw materials and domestically made parts whenever possible, which cuts down on transportation emissions and ensures the materials are responsibly harvested and produced. We use sustainable packaging materials. Most importantly, we make and sell timeless, durable items that are made to last generations." We, at Greenspiration Home, couldn't agree more. And we're so thankful that School House Electric put those beautiful old lamp molds back into service. Those who love and appreciate history, especially America's "heyday" of manufacturing, won't want to miss the video of Brian Faherty explaining the birth of School House Electric with wonderful footage of these molds being restored. It is a refreshing reminder of the artistry that still exists in American manufacturing.